Laminitis in horses can be a very serious disease that affects the hooves of a horse and can cause lameness in all breeds of horses. Laminitis occurs when there is a cut off of blood flow to the laminae in hooves. Inflammation contributes to the weakening of these laminae and can separate the laminae where it attaches to the coffin bone over time. This disease affects the integrity of the horse’s hooves and results in pain and damage. Laminitis in horses can be treated but their level of recovery may differ according to many factors such as the severity of the damage and promptness of treatment. That’s why it’s better to focus on prevention. Besides these causes, there are certain factors that increase a horse’s susceptibility to developing laminitis. 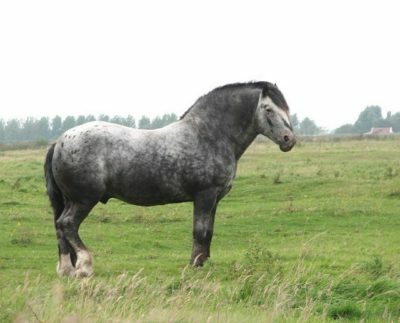 Horses with Cushing’s Syndrome (PPID) have a higher risk of developing laminitis. Your vet will often recommend testing your horse for PPID if laminitis symptoms appear for no apparent reason. Horses that have experienced laminitis before are susceptible to reoccurrence. These horses also tend to experience the symptoms of the disease much more severely. Identify Horses at Risk of EMS – Horses suffering from equine metabolic syndrome or EMS tend to have a higher risk of developing laminitis. One of the most basic steps you can take is to identify horses that are at risk of developing EMS and then take necessary precautions. Horses that are prone to developing EMS tend to be easy keepers, so they’ll gain weight easily even if there’s not much grain included in their diet. They might also be obese or they will exhibit signs of regional adiposity, which involves the development of fat deposits in certain areas of the body. A horse that is at risk of EMS may also have fat that accumulates along the crest of its neck. You may notice that there are unusual pads of fat around the tail head. These pads may also be present near the sheath, behind the shoulders, or near the mammary glands. Reduce Starch and Sugar Consumption – If a horse is suffering from a metabolic disorder, even the tiniest portions of sugar and starch can result in laminitis. This means you will need to restrict or even completely eliminate grains, sweet feeds, and molasses from their diet if the horse is overweight. If the horse requires extra calories, opt for a feed that enables your horse to derive calories from fat rather than sugars. You can find some low-sugar feeds designed for horses that are at risk of the disease. And it would be wise to break up your horse’s daily ration into multiple small meals, which are served throughout the day. This will help prevent the levels of glucose and insulin from fluctuating drastically. 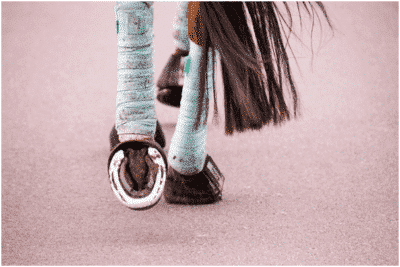 Take Proper Care of a “Good” Hoof – As mentioned earlier, one of the causes of laminitis in horses is when a horse overcompensates by using one leg more because the other is injured. If your horse has sustained a serious leg injury, it’s vital that you ensure proper support and protection for the good leg. A good precaution would be to stick to regularly scheduled visits from your farrier to make sure your horse’s hooves are kept at a good length and they are distributing their weight correctly. When shoeing a horse that has already had laminitis there are many things to consider. Your vet and your farrier will have to work out a plan that will help your horse prevent reoccurrences. Options such as padded shoes, therapeutic shoes, frog supports, and corrective trimmings can help with treatments. Providing necessary supplements that will strengthen the hoof and ensure better hoof health are helpful whether the horse has had laminitis previously or not. Take It Slowly When Making Dietary Changes – When you make sudden changes to your horse’s diet, it can significantly disrupt the intestinal flora and result in laminitis. Whenever you’re going to introduce any new variety of feed into its diet, do it gradually. Blend only a small amount of it into the horse’s usual feed at first. You can then gradually increase the proportion over the coming days. 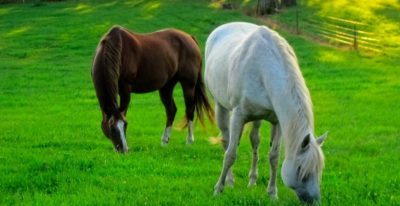 Limit Grazing Time in Lush Pastures – Pasture grasses are rich in a type of sugar known as fructan, so excessively grazing in lush pastures can cause laminitis in horses. This can be a bit of a challenge because what’s excessive to one horse may not necessarily be excessive to another. Fructan levels also fluctuate throughout the year, normally peaking during spring and fall. Later afternoons and late mornings are also periods of high fructan levels. It’s best if you can get a lab analysis of the sugar content in your pastures periodically at different times of the year. This means you need to test the sugar content in different climates and seasons to understand the changing pattern. While this process sounds daunting, it can be highly beneficial for your horse’s long-term health. Avoid Using Black Walnut Shavings – Black walnut is extremely dangerous for your horses. They can develop acute laminitis just eight hours after standing on wood shavings containing only 20% black walnut wood. Any bedding products designed for horses tend to be completely free of this ingredient. However, there may be times when you buy wood shavings or hog fuel in bulk from your local suppliers. In these instances, you need to make it clear to the supplier that the ingredient cannot be included at all. These are some of the best ways you can help prevent laminitis in horses. As you can see, it’s vital to maintain a healthy weight and restrict sugar and starch intake to prevent the condition. It is also essential that you do things gradually when you’re making changes to the horse’s diet. Have more questions about preventing laminitis in horses? Feel free to ask us!